When I was little, I avoided guacamole like the plague. My reasons for hating guac? It was mushy, and it was green. One day, when I was feeling a tad bit adventurous, I dipped my chip into the creamy, dip and I’ve been seriously obssessed ever since. I must confess that I feel guilty about my former hatred of the wonderful dip, especailly since my two reasons for avoiding it (green and mushy) were not good reasons at all to miss out on all of guacamole’s magic for the first decade of my life. To make up for this, I came up with three very good reasons to love guacamole. 1. Guacamole gets you friends. Eating guacamole is a communal event. Nothing says “be my friend” like a big bowl of chips and an even bigger bowl of guacamole. Whip some of this out and you’ll be one of the most popular kids in town. 3. Guacamole is healthy. It’s full of healthy fats, omega-threes, fiber and all that jazz. Did you know avocados are the most nutritionally complete food? Humans could theoretically survive on avocados alone. Pass the chips. Still skeptical? This “guacamole” isn’t traditional at all. First, it’s full of garlic, basil, and Parmesan cheese instead of cilantro, lime and red onions — adding an Italian twist to the Mexican favorite. Second, I grilled my avocados on the panini press, adding a whole new warm, crispy flavor to them (it’s proven that everything tastes better with grill marks…). Third, I threw in some super savory ingredients like white truffle salt and a robust (somewhat pricey) extra virgin olive oil — these luxurious ingredients sure paid off. It’s warm, herby, and cheesy — and it’ll make you look at this delicious dip in a whole new light. Looks can be deceiving, but taste speaks for itself. Did you ever hate a food because of the way it looked? Heat your panini press to the highest setting (alternatively, you could use a gas or charcoal grill). Halve and pit the avocados. Drizzle generously with olive oil and lemon juice and season with salt and pepper. I thought it would be a good idea to try four very different recipes for this showdown. However, each of these recipes were very good in its own way. I’m not saying that to be diplomatic. Just like their is a perfect outfit for every occasion, there is a perfect sweet potato casserole for every occasion. Here’s the lowdown. Perfect for kids, with a beautiful presentation that adults will enjoy as well! Martha’s sweet potato casserole has a very simple base (just sweet potatoes, milk, and a dash of salt and pepper). But it’s topped with a big, bubbly layer of toasted marshmallows. It is by far the prettiest of the four casseroles — the toasted marshmallows look so enticing and beautiful on the table! Oh. My. God. This sweet potato casserole is knock-your-socks-off tasty. The buttery, brown sugar topping gets all crispy and delightful. My mom said she is still thinking about this casserole to this day! Sure there’s a lot of buttery and brown sugar-y goodness in there, but in the taste department this casserole was the clear winner. This casserole held its own extremely well against its buttery and sugary counterparts. Sweetened with maple syrup and topped with coconut oil and whole wheat flour, this casserole is not only healthy, but delicious too! Trust me! 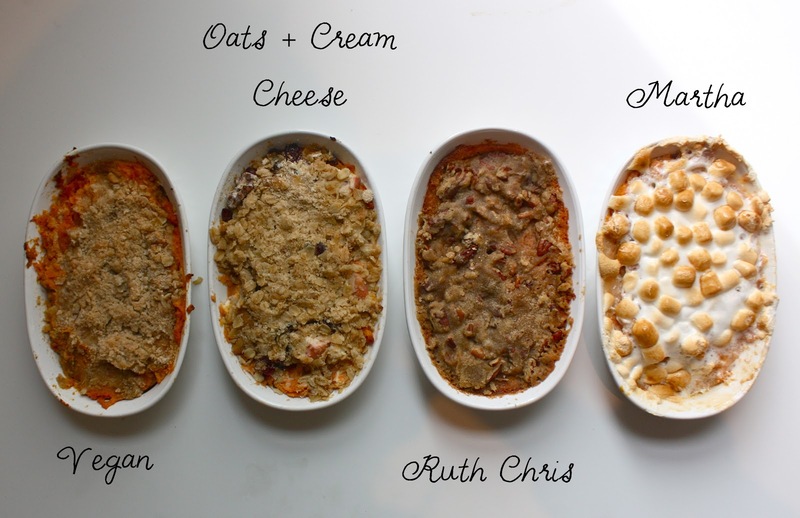 Hope this quick showdown helps you choose which sweet potato casserole to make for your Thanksgiving feast! Thanksgiving is just around the corner, and I’ve been busy planning my menu for a while now. I’ve already found the perfect cornbread, we’ve ordered a turkey, I have six pie crusts in my fridge… the only thing left is the stuffing! Stuffing has always been my favorite Thanksgiving dish, so this year, it better be good. We usually make stuffing from a mix, but I want to make homemade stuffing this year. I was getting frustrated finding a recipe that measured up to Kraft’s Stove Top Stuffing Mix. The recipes that I tried all have either too much chicken broth, are to mushy, or are too oily. Luckily, this one is different. It’s not a traditional stuffing (i.e. you can’t actually stuff a turkey with it), but boy is it good. It’s technically a bread pudding, but when served in a casserole dish, it can totally pass for stuffing. It is a wonderful medley of sweet and savory flavors. Apples, fluffy bread, and whipping cream complement sage, cornbread and onions. This recipe is from the restaurant Ris in Washington D.C.. The Washingtonian has a series called “recipe sleuth” where they track down awesome recipes from famous restaurants in Washington D.C.. I love knowing that I can save time and money making real, restaurant food at home. It makes me feel like I’m beating the system. When I tested the recipe, I used a loaf of brioche from Whole Foods. However, there was a sale on panettone at the grocery store this weekend, so I am planning on replacing the brioche with panettone for our Thanksgiving feast. I use homemade cornbread in this recipe (bake up a double batch, use half in this recipe, and serve half as a side dish); however, store bought cornbread would work just fine as well. NOTE: The panettone makes this recipe absolutely delicious! Brioche and challah are good, but panettone makes this casserole absolutely legendary. If you can get your hands on one, by all means use panettone. Melt 1 tablespoon butter in a pan over medium-high heat. still firm. Remove from pan and set aside. occasionally until they’re soft and lightly colored, about 5 minutes. Season with salt and pepper. Set aside and let cool. separate bowl, whisk together the eggs, egg yolk, Tabasco, and cream. minutes, stirring occasionally. Taste and adjust seasoning if necessary. for about 30 minutes or until an inserted toothpick comes out clean. let cool before mixing with other ingredients. Most of the trees in my neighborhood have lost their leaves. I have to wear a coat to school everyday. I’ve swapped my iced chai teas with pumpkin spice lattes. What does this all mean? It’s time to whip out comfort food recipes! Nothing hugs the soul on a chilly day like buttery, cheesy goodness. I can’t think of anything more “comforting” than a bowl of buttery noodles, swaddled in gooey cheese and topped with toasty bread crumbs. I have a bunch of comfort recipes up my sleeve (mainly because they all look oh-so enticing when they pop up on my Pinterest board). However, mac-and-cheese is the ULTIMATE comfort food, so I had to get this recipe out to you before Thanksgiving rolls around! I tried recipes from some of my favorite blogs: The Cooking Actress, Martha Stewart, Brown Eyed Baker, and A Cup of Jo. 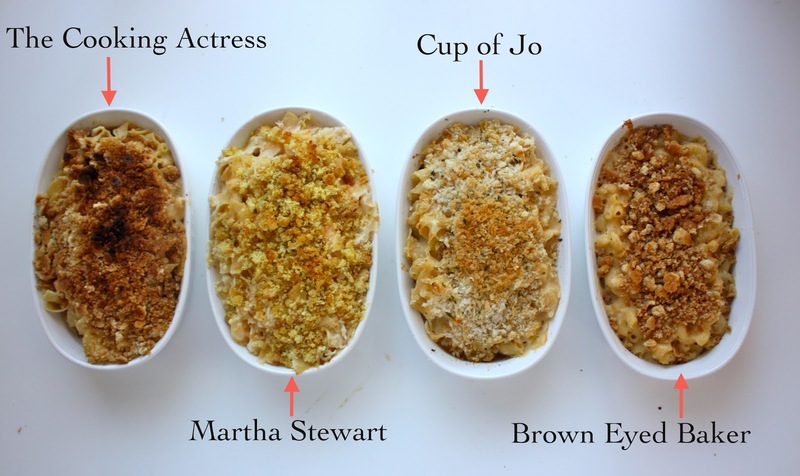 The winner of this Showdown was the Cooking Actress’ Brown Butter Mac and Cheese. It won me over with that lovely, nutty aroma of brown butter. I got nervous when my dad said that it was “interesting” (he is quite the traditionalist, and “interesting” isn’t always great); however, he said that it was diffrerent in a good way. The only change that I made to the Cooking Actress’ recipe was I used Honey Wheat Ritz crackers as opposed to regular Ritz. The Honey Wheat crackers added a nice sweetness to the dish, which complemented the sharp cheddar and parmesan. If you’ve got a family full of kids (or adults), this will be much appreciated at your Thanksgiving table. As always, feel free to challenge my recipe! When the air gets chilly, there is nothing I love more than a big, steamy bowl of my mom’s soup. She makes ratatouille, chili, and minestrone. But my all time favorite is her butternut squash soup. It is delicious on its own, but it’s absolutely perfect with a big wedge of custard–y cornbread on the side. A cake with spiders in it? God I hope not! A spider shaped cake? A spider shaped cake? Won’t that be hard to get out of the pan? Soon enough, I found out that this cake has absolutely nothing to do with spiders. Whew. Because I am completely arachnophobic. It’s actually a delicious cornbread with a lovely, custard filling. Crumbly, buttery, and with a super-crisp outside. Exactly how cornbread should be. I love how it gets baked in a cast iron skillet. It makes me feel all nice and rustic. A warm slice of this cake covered in maple syrup is about as good as it gets. the oven and let it get hot while you mix the batter. just until the batter is smooth and no lumps remain. Pour the batter into the heated dish, then pour the cream into the center of the batter—don’t stir. Bake for 50-60 minutes, or until lightly browned. Serve warm with maple syrup.